Quilting requires a sewing machine that will give their imagination free rein. The the PFAFF® quilt expression™ 4.2 sewing machine has a unique design that's spacious, bright and precise. With its origin in German tradition, you're about to discover what the name PFAFF® stands for...a sewer's dream! Realize your creative potential and experience with a new dimension of sewing! If you're searching for new inspiration, the highest level of sewing ease and modern technology...you'll find it--and much more-- With a PFAFF expression™ 3.5 sewing machine! Experience the difference that makes this sewing machines truly special, with a large sewing space, perfectly illuminated sewing area and the large high-resolution touch screen that will optimize your work process.The original IDT™ System guarantees absolutely even fabric feed from top and bottom. Take your sewing to the next step with the Pfaff performance™ 5.0 sewing machine! Unbelievably beautiful – More than 300 utility and decorative stitches are included with this PFAFF® sewing machine. Including the original PFAFF® 9 mm Stitches and the unique PFAFF® Maxi Stitches, up to 48 mm wide, for enchanting embellishments. Expect precise stitch results on all kinds of fabric, thanks to the original IDT™ System. Experience exceptional capability including an extended sewing surface for large projects, a beautifully illuminated sewing area and large Graphic Display. Comes with more than 100 stitches for endless creativity and a Decorative Tapering feature that lets you create unique embellishments. An inspirational machine that comes with more than 100 stitches, including utility, quilt, satin, heirloom and decorative stitches, to increase your creativity. 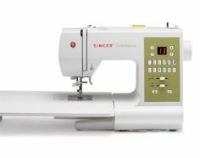 A special sensor system gives you perfect fabric feed and the extended sewing surface lets you work on large projects. This machine has many practical features you will love, such as the built-in needle threader, a handy Sewing Guide Reference Chart, a hard cover for storage and an effortless one-step buttonhole. Emerald machines let you adjust your sewing speed. Plus, you decide if the needle stops in the up or down position when you stop sewing. All you need for sewing is an Emerald! If you're looking for a convenient, compact and lightweight sewing machine for travel and classes, The H|Class 100Q is for you. Perfect for those who are new to sewing and want to create trendy looks and personalized items. It's time to start something beautiful! If you are sewing on a mechanical machine or an older computerized model, you are missing out on the benefits of modern technology. Our OPAL™ 650/670 computerized sewing machines are extra-efficient with loads of built-in assistance to change the way you sew for the better! Let your Husqvarna Viking® OPAL™ sewing machine focus on delivering the best results while you relax and focus on the joy of sewing. This sewing machine is perfect for new and skilled quilters alike. With many advanced features, your sewing experience will be relaxing and creative. Comes with four bonus quilting feet to expand your creative quilting and sewing possibilities. The large sewing surface lets you manage large quilts and other sewing projects with ease.